What’s the difference between Boris Johnson, David Cameron and friends in the Bullington Club and the rioters? 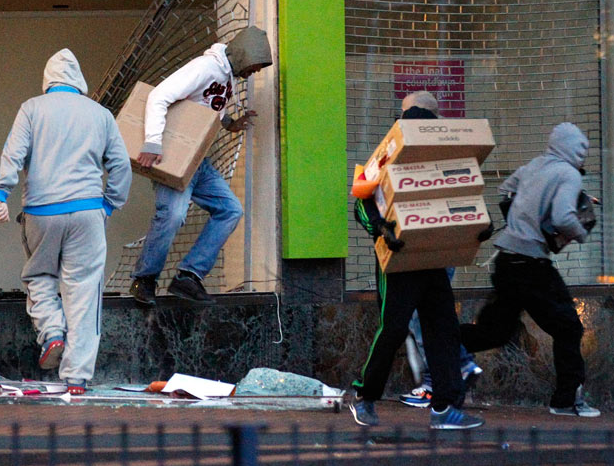 When David and Boris trashed a restaurant with their mates they wore suites and ties, the rioters wore jeans and hoodies. They paid for the damage and created jobs ? A small but all important detail. What is the difference between Class bigotry and Racial bigotry ? Zero, bigotry is bigotry,regardless of whatever sad excuse used for hating people from a different group to your own. “Class” bigotry? What “class”? Both the bankers and the looters are in the same class – the one called “scum of the earth”. I think your anger and hatred has rather taken over your reason hasn’t it? Anyone who seeks to defend the bankers with such a putrid excuse is in the same class as well. Bankers don’t create jobs. They are parasites just like the looters and living off the ever diminishing number of people in Britain who do work of real value. As for paying for the damage they cause, that’s called “perverting the course of justice”. exactly what i wanted to say ! 1 set of them gets replayed on bbc news over and over,,,the other bunch dont get televised!